the sun has no solid surface. The Sun's core is the central region where nuclear reactions consume hydrogen to form helium. These reactions release the energy that ultimately leaves the surface as visible light. These reactions are highly sensitive to temperature and density. The individual hydrogen nuclei must collide with enough energy to give a reasonable probability of overcoming the repulsive electrical force between these two positively charged particles. The temperature at the very center of the Sun is about 15,000,000° C (27,000,000 ° F) and the density is about 150 g/cm³ (about 10 times the density of gold or lead). Both the temperature and the density decrease as one moves outward from the center of the Sun. The nuclear burning is almost completely shut off beyond the outer edge of the core (about 25% of the distance to the surface or 175,000 km from the center). At that point the temperature is only half its central value and the density drops to about 20 g/cm³. The radiative zone extends outward from the outer edge of the core to the interface layer or tachocline at the base of the convection zone (from 25% of the distance to the surface to 70% of that distance). The radiative zone is characterized by the method of energy transport - radiation. The energy generated in the core is carried by light (photons) that bounces from particle to particle through the radiative zone. Although the photons travel at the speed of light, they bounce so many times through this dense material that an individual photon takes about a million years to finally reach the interface layer. The density drops from 20 g/cm³ (about the density of gold) down to only 0.2 g/cm³ (less than the density of water) from the bottom to the top of the radiative zone. The temperature falls from 7,000,000° C to about 2,000,000° C over the same distance. The interface layer lies between the radiative zone and the convective zone. The fluid motions found in the convection zone slowly disappear from the top of this layer to its bottom where the conditions match those of the calm radiative zone. This thin layer has become more interesting in recent years as more details have been discovered about it. It is now believed that the Sun's magnetic field is generated by a magnetic dynamo in this layer. The changes in fluid flow velocities across the layer (shear flows) can stretch magnetic field lines of force and make them stronger. This change in flow velocity gives this layer its alternative name - the tachocline. There also appears to be sudden changes in chemical composition across this layer. The convection zone is the outer-most layer of the solar interior. It extends from a depth of about 200,000 km right up to the visible surface. At the base of the convection zone the temperature is about 2,000,000° C. This is "cool" enough for the heavier ions (such as carbon, nitrogen, oxygen, calcium, and iron) to hold onto some of their electrons. This makes the material more opaque so that it is harder for radiation to get through. This traps heat that ultimately makes the fluid unstable and it starts to "boil" or convect. Convection occurs when the temperature gradient (the rate at which the temperature falls with height or radius) gets larger than the adiabatic gradient (the rate at which the temperature would fall if a volume of material were moved higher without adding heat). Where this occurs a volume of material moved upward will be warmer than its surroundings and will continue to rise further. These convective motions carry heat quite rapidly to the surface. The fluid expands and cools as it rises. At the visible surface the temperature has dropped to 5,700° K and the density is only 0.0000002 gm/cm³ (about 1/10,000th the density of air at sea level). The convective motions themselves are visible at the surface as granules and supergranules. The photosphere is the visible surface of the Sun that we are most familiar with. Since the Sun is a ball of gas, this is not a solid surface but is actually a layer about 100 km thick (very, very, thin compared to the 700,000 km radius of the Sun). When we look at the center of the disk of the Sun we look straight in and see somewhat hotter and brighter regions. When we look at the limb, or edge, of the solar disk we see light that has taken a slanting path through this layer and we only see through the upper, cooler and dimmer regions. This explains the "limb darkening" that appears as a darkening of the solar disk near the limb. A number of features can be observed in the photosphere with a simple telescope (along with a good filter to reduce the intensity of sunlight to safely observable levels). These features include the dark sunspots, the bright faculae, and granules. We can also measure the flow of material in the photosphere using the Doppler effect. These measurements reveal additional features such as supergranules as well as large scale flows and a pattern of waves and oscillatins. The chromosphere is an irregular layer above the photosphere where the temperature rises from 6000° C to about 20,000° C. At these higher temperatures hydrogen emits light that gives off a reddish color (H-alpha emission). This colorful emission can be seen in prominences that project above the limb of the sun during total solar eclipses. This is what gives the chromosphere its name (color-sphere). The transition region is a thin and very irregular layer of the Sun's atmosphere that separates the hot corona from the much cooler chromosphere. Heat flows down from the corona into the chromosphere and in the process produces this thin region where the temperature changes rapidly from 1,000,000ºC (1,800,000ºF) down to about 20,000ºC (40,000ºF). Hydrogen is ionized (stripped of its electron) at these temperatures and is therefore difficult to see. Instead of hydrogen, the light emitted by the transition region is dominated by such ions as C IV, O IV, and Si IV (carbon, oxygen, and silicon each with three electrons stripped off). These ions emit light in the ultraviolet region of the solar spectrum that is only accessible from space. The Corona is the Sun's outer atmosphere. It is visible during total eclipses of the Sun as a pearly white crown surrounding the Sun. The corona displays a variety of features including streamers, plumes, and loops. These features change from eclipse to eclipse and the overall shape of the corona changes with the sunspot cycle. However, during the few fleeting minutes of totality few, if any, changes are seen in these coronal features. The solar wind streams off of the Sun in all directions at speeds of about 400 km/s (about 1 million miles per hour). 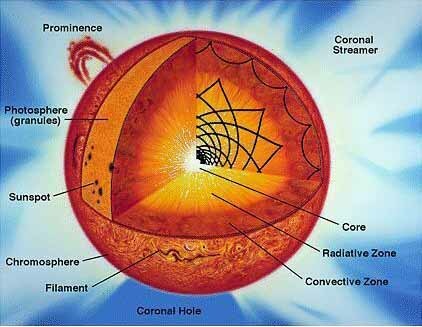 The source of the solar wind is the Sun's hot corona. The temperature of the corona is so high that the Sun's gravity cannot hold on to it. Although we understand why this happens we do not understand the details about how and where the coronal gases are accelerated to these high velocities. This question is related to the question of coronal heating.